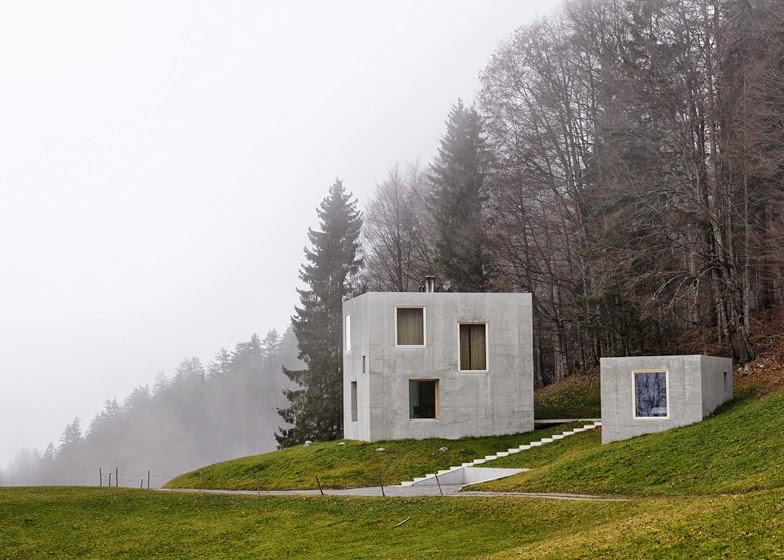 Haus Rüscher, designed by OLKRÜF, is a minimalist cubic concrete house in the mountains of western Austria. 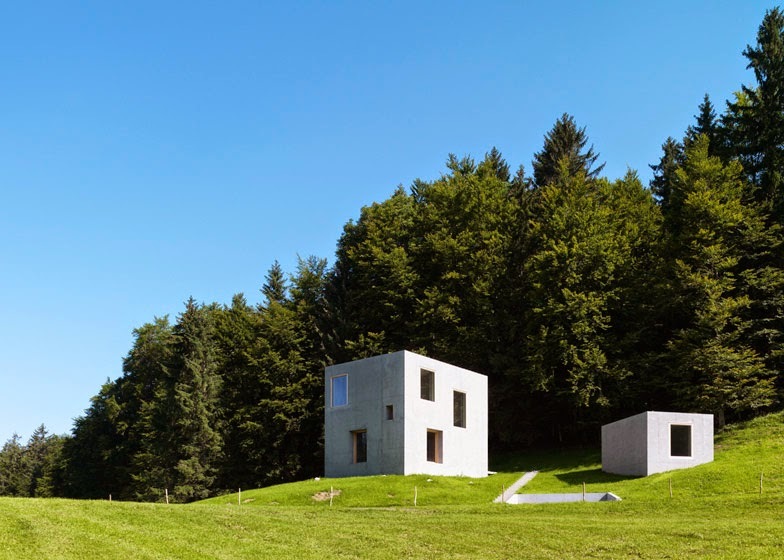 The house is conceived as two different compact volumes, with minimum impact on their surrounding landscape. 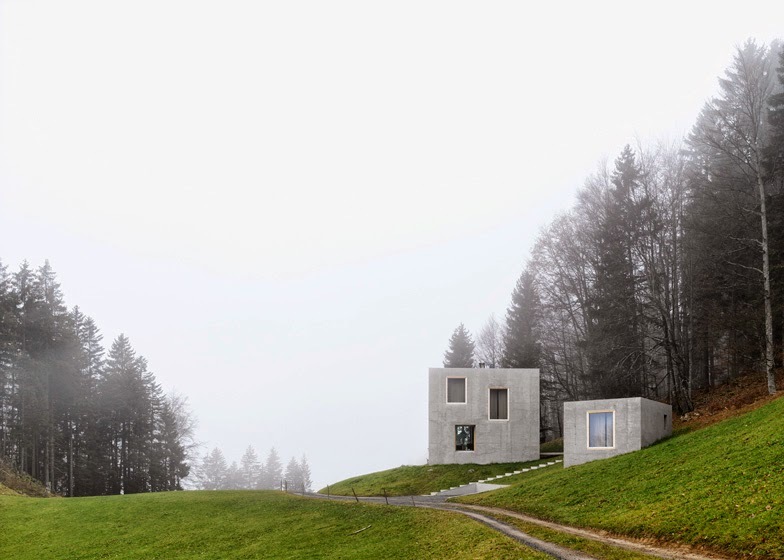 As solitary solid masses embedded in the landscape sits the project Haus R. It hangs on a steep incline at almost 1100 m in altitude and a kilometre from the nearest village of Schnepfau. To the north, the houses back on to thick woodland that cover the rest of the hill, in all other directions lay pasture lands. 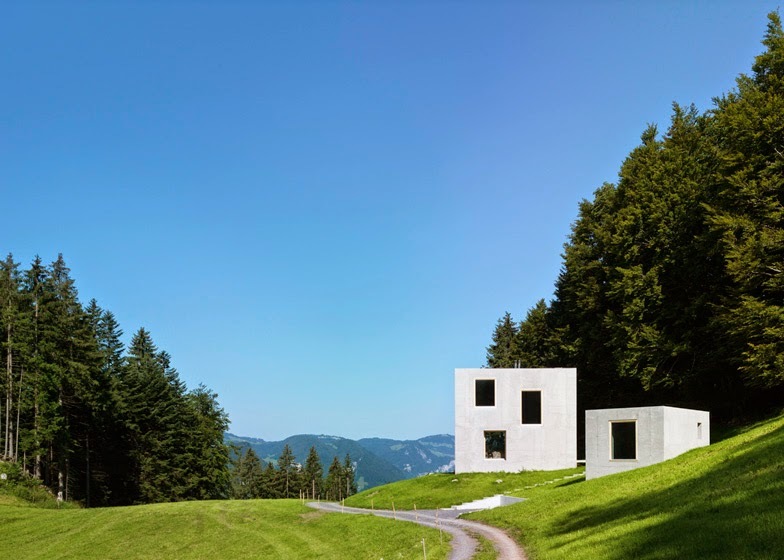 Because of the elevated position the house enjoys incredible views in every direction, especially of the Kanisfluh mountain and the valleys of the Bregenzerwald. 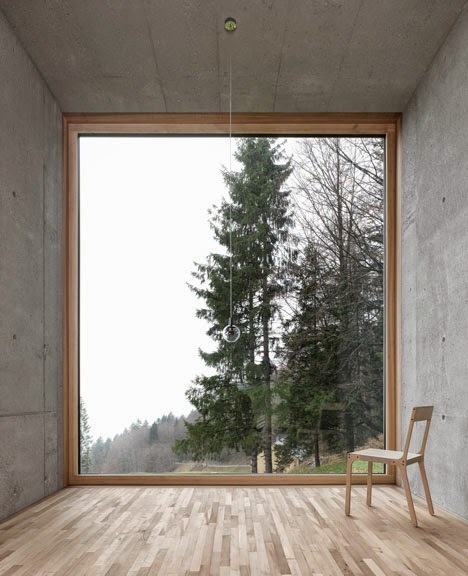 The sparsely populated landscape is reflected in the simple form and basic materials chosen for the design. The double shell is constructed without any horizontal construction joints. The entire outer wall was constructed as one solid piece. 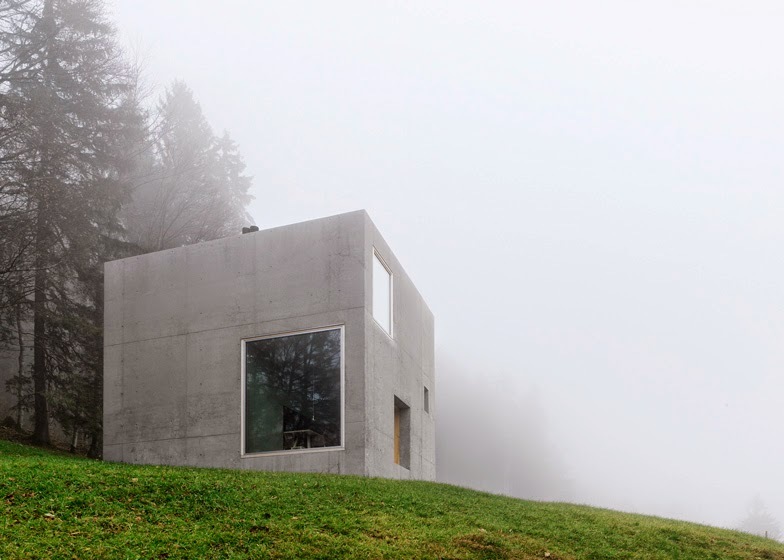 In this way the solid concrete hull corresponds to the simple mass of the surrounding mountains. 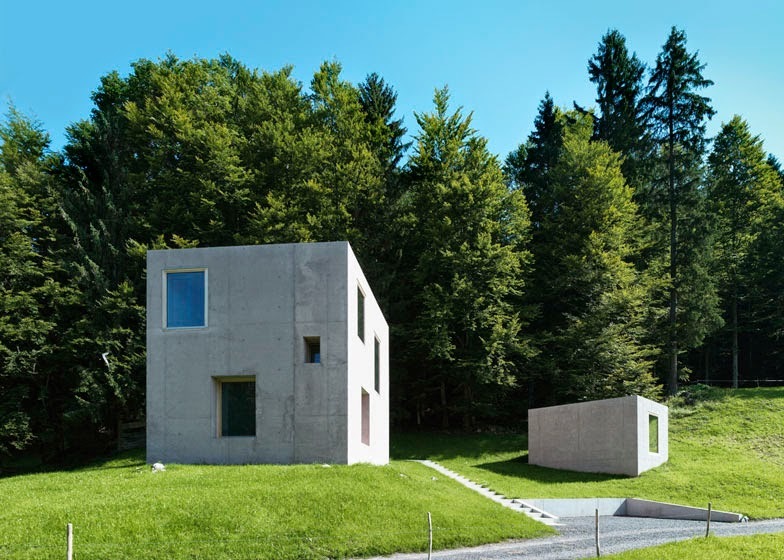 The grassland grows right to the edge of the building to emphasize the concept of the house as a rock emerging from the ground naturally. 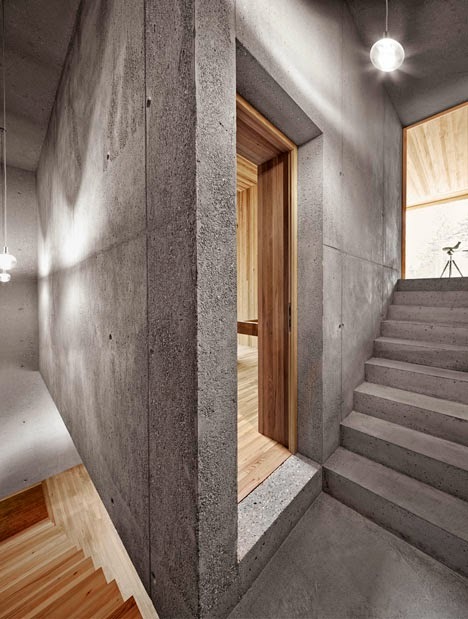 In addition, a small guest house was included in the design that abides by the same rules of design. It compliments and emphasises the first by creating a ‘natural rock formation’ rather than a solitary monument. 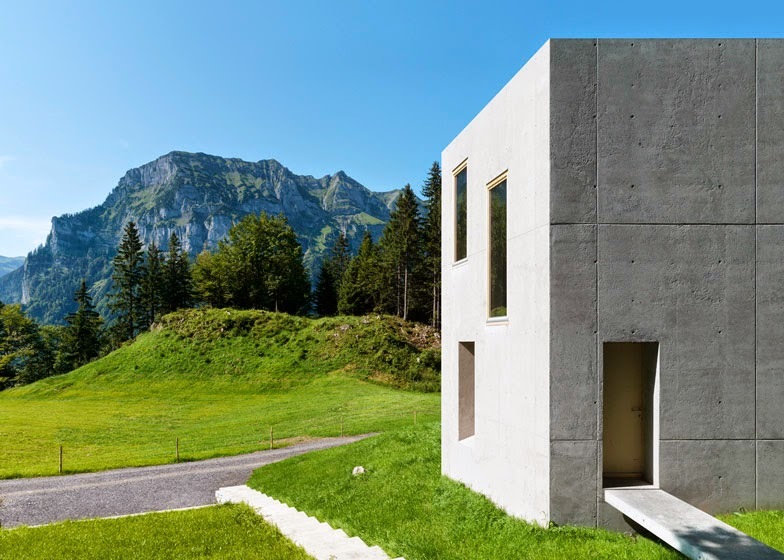 It was important for the client to build a very compact house that would not spoil the local landscape by sealing over the top surface with unnecessary concrete, gravel or tarmac. The top surface surrounding the building had to remain as natural as possible. It was also important that house had a generous living space for entertaining and accommodating guests, but should not be too big for everyday use. As well as providing open space, the design had to incorporate smaller, more intimate areas for when people wished to relax in peace. The guest house and the separation of the sleeping rooms using split levels, are a result of these thought processes. From the mountain track leads a set of stairs between the two houses, which are both entered from the rear, so that the entrances are not visible from the track. The ground floor is shared into separate zones through different room heights in the living and eating area, the kitchen and the circulation paths. The high ceilings in the living space allow incredible views in all directions. 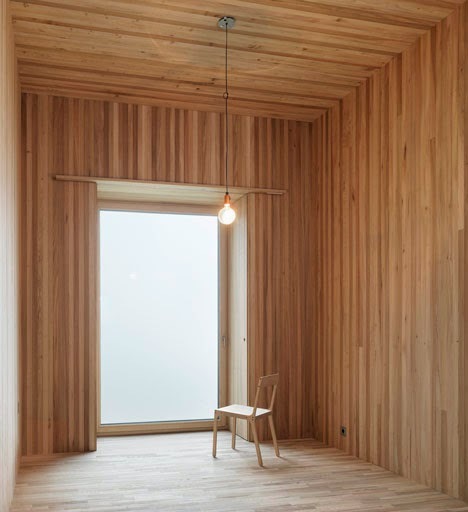 In the west, the rooms entire height and width is glazed to give a panoramic view of the surroundings. The lower kitchen area is orientated towards the open living room, above which a vertical air space flows through all the levels. 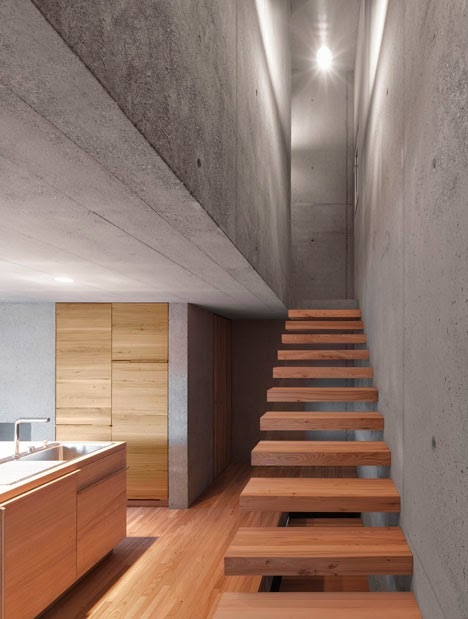 The first floor and cellar levels are reached through a set of floating wooden stairs that pierce the concrete of the outer wall, supporting themselves on one side only. The differing room heights also resulted from the needs of the two very different sleeping rooms. The lower sleeping room was designed for the children, and was intended to be able to accommodate a double bed or bunk bed system and therefore utilises an intentionally higher format. Latching on to the side of this room is the slightly bigger main bedroom, which has a normal room height and enjoys views of the Kanisfluh. In addition, the guest house bedroom replicates the feel and elegant style of the main house but in miniature. In the cellar, beside the storage rooms and the technical room, there is a small sauna and separate shower room. The 65cm thick hull of the building was formed in two parts: The outer shell and the core insulation managed to avoid the usual visible construction joints by being constructed from one continuous piece of concrete over 9.5 meters in height. Connecting on the inside, the internal walls are also constructed in one solid piece, with the interior walls, for the most part, echoing this process by casting several walls straight through multiple levels in a single piece. The floors are then set into place afterwards by drilling metal into the triple height finished wall to provide the basis for the supporting structure. 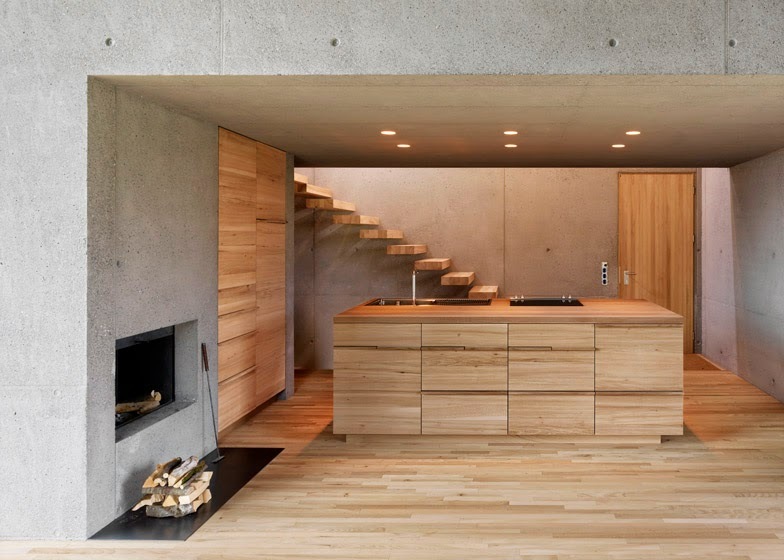 All the exposed concrete areas in Haus R have a sandblasted finish, the floor is fitted out in Elm and in the cellar the floor is finished in polished screed. 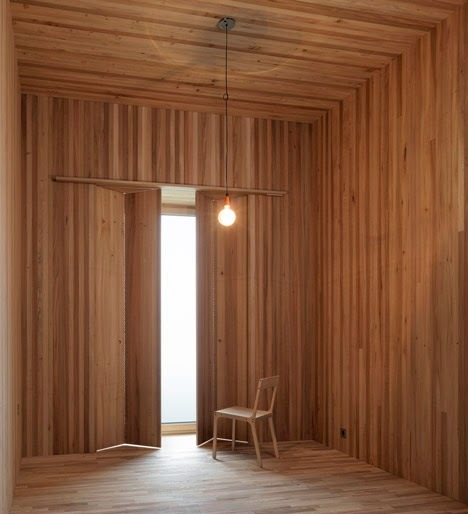 By contrast, the two bedrooms (and the guest house) are completely clad in wood. The windows in these rooms are flush with the outside of the building whereas the windows on the ground floor are flush with the inside of the building, this was to allow the inclusion of sun blinds that prevent overheating in during the summer. The jamb is constructed entirely from concrete all the way up to the beginning of the window frame. Both roofs were designed inverted. 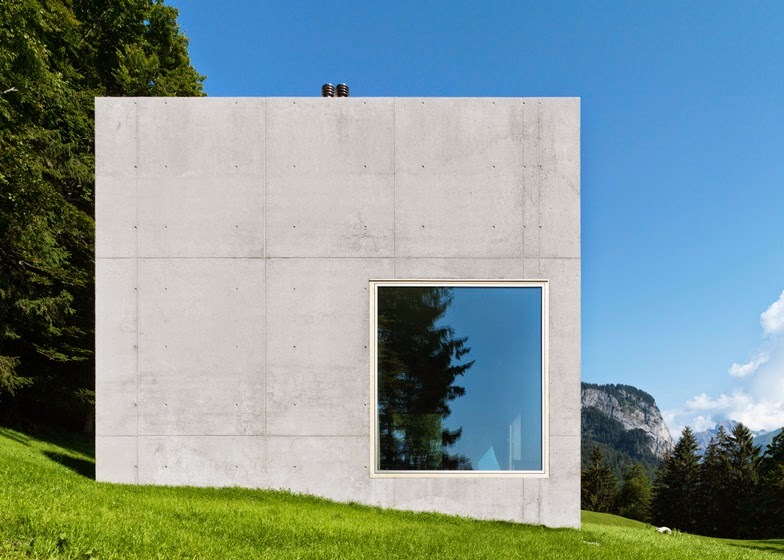 As an important fifth facade, they were finished with a layer of large format prefabricated concrete slabs. The house is also fitted out with a ground source heat pump that provides the majority of the energy for the under floor heating all year round. 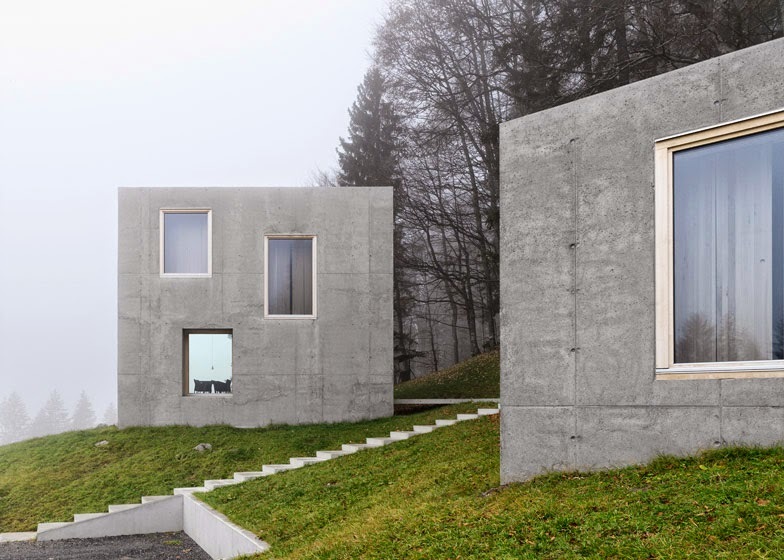 The thermal mass of the building is exceptional for its size due to the buildings extensive use of exposed concrete within the insulation shell. This provides stable warmth through the winter months and a consistent cooling effect during the hot summer days. The construction of the building was very complicated and challenging for the many reasons; the concrete walls were cast in one single piece which was experimental for both the builders and the architects. The mountain weather was unpredictable and often extreme. Site access was difficult for the heavy construction vehicles. And the large format windows, that were inserted into the concrete jamb, had very little margin for error. However, the house, from the initial design to the finished building hardly changed at all. This was only possible due to an intense and detailed communication between the architect, the construction company and the client. An important element in this process was the guest house. It was constructed using the exact same methods and materials as the main building and provided a useful proving ground. In this way all parties were able to evaluate and optimize the experimental construction methods for the main building, ensuring a very high quality finish.